396 pages | 222 Color Illus. | 45 B/W Illus. Sustainable Forest Management provides the necessary material to educate students about forestry and the contemporary role of forests in ecosystems and society. 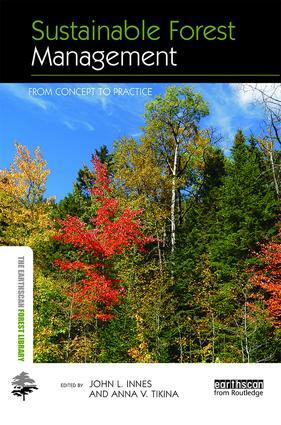 This comprehensive textbook on the concept and practice of sustainable forest management sets the standard for practice worldwide. Early chapters concentrate on conceptual aspects, relating sustainable forestry management to international policy. In particular, they consider the concept of criteria and indicators and how this has determined the practice of forest management, taken here to be the management of forested lands and of all ecosystems present on such lands. Later chapters are more practical in focus, concentrating on the management of the many values associated with forests. Overall the book provides a major new synthesis which will serve as a textbook for undergraduates of forestry as well as those from related disciplines such as ecology or geography who are taking a course in forests or natural resource management. John L. Innes is Forest Renewal BC Chair in Forest Management and Dean of the Faculty of Forestry at the University of British Columbia, Canada. Anna V. Tikina is an Adjunct Professor in the Department of Forest Resources Management and a consultant specializing in Sustainable Forest Management and International Environmental Governance at the University of British Columbia, Canada.